A surprising number of installations are using large number of DALI ballasts controlled from DMX. We recently supplied 1,024 channels of DALI conversion to Hamburg Airport for the main hall. 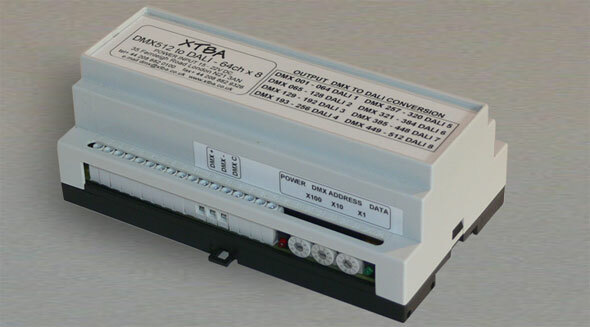 In order to make the installation of such large systems as painless as possible the XTBA DMX512 to DALI 64 channel x 8 has been introduced. Housed in a single DIN case it will convert all 512 DMX channels into eight outputs of DALI (64 channels each). If less than 512 DMX channels are required the DALI output length can be reduced to allow for greater speed. 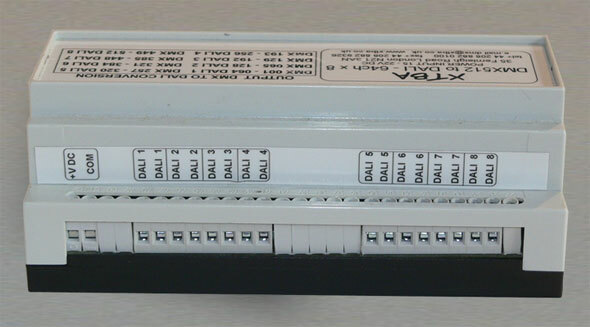 The unit also features a ballast programmer and will also drive the DALI ballasts direct without the need of an additional DALI power supply. The unit also has a user selectable output curve to improve the fade profile. In addition to the above XTBA offers a custom service for DMX/DALI interfaces. DALI to analogue converters are also available. This is now fully RDM compatible. Note new release of manual now available. We now have an added extra for this product, the External Switch Option. 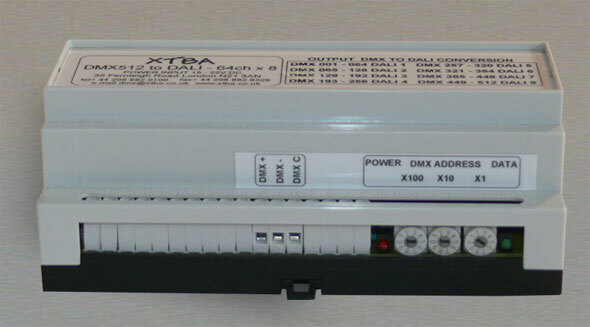 This allows the DALI output to be controlled by a switch in the event of DMX loss. See page here for more information on how it works (aka The Manual! ).